Digital, dual set-point, microprocessor-based temperature controller with ON/OFF, Neutral Zone ON/OFF and PID control (with an AUTO-TUNING function) and two relay outputs. 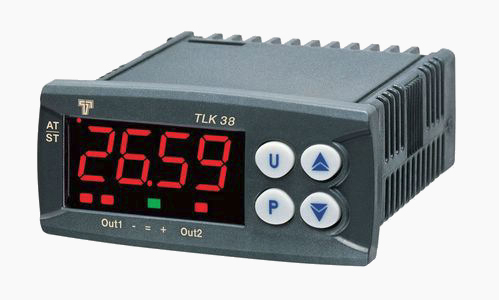 The TLK38-S is a simplified, and easier to use, version of the discontinued original TLK38. The new “S” version is identical in size and functionally is similar however, the list of parameters has been reduced. This makes the “S” model far easier to program (there’s only one list of parameters to scroll through). TLK38-S is a digital microprocessor-based temperature controller with ON/OFF, Neutral Zone ON/OFF and PID control with an AUTO-TUNING function. Process values are presented on 4 red LED displays, while the output status is indicated by 2 LED ‘dots’ at the bottom of the display. The instrument is also equipped with 3 LED programmable shift indexes and an LED indication AUTO-TUNING is taking place. Depending on the model, the TLK38-S can have either 1 or 2 outputs: relay type, or that can drive a solid state relays (SSR). 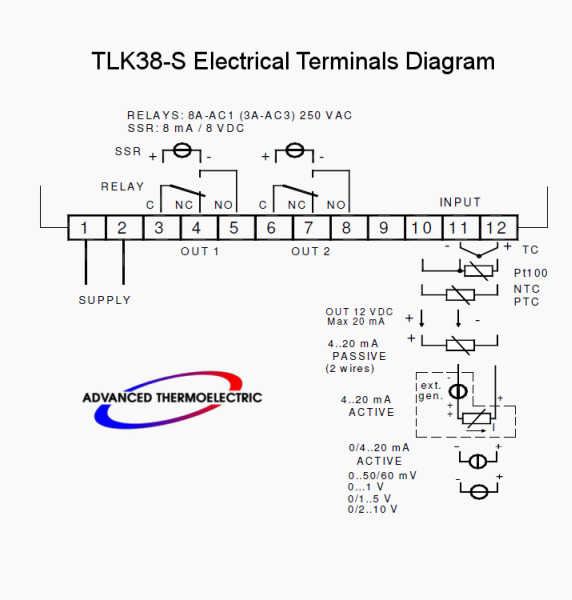 With two set points available, the TLK38-S may be programmed for both (cooling) and reverse action (heating). Great for enclosures that require both cooling in warm weather and warming in winter. 100...240 VAC ("H" type). Contact us for availability. 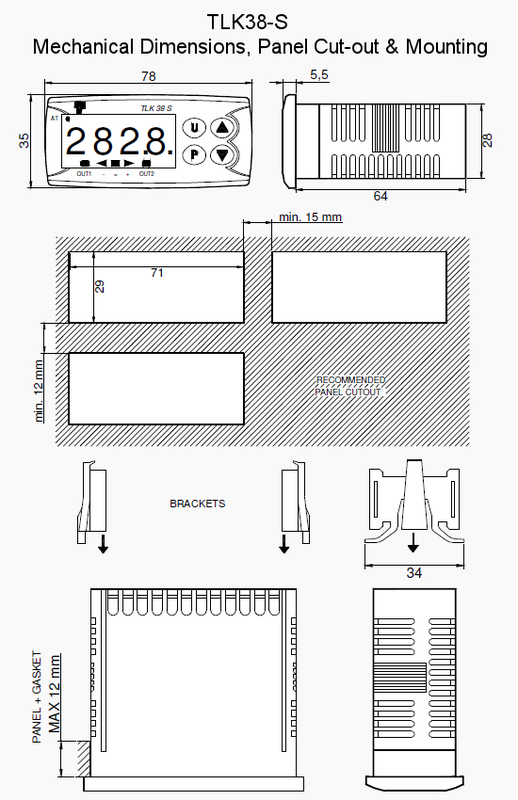 See TLK38-S User Manual (.pdf) for other sensor ranges. In order to change the set-point push the “P” button for a moment and SP1 will be displayed. Press the “P” button again and the current set-point value will be displayed. Use the UP or DOWN arrow keys to make a change to the set-point. Leave the controller alone for about 20 seconds and the new value will be programmed. For warming, first modify the wiring, as illustrated below (to reverse polarity to the TEC/s) then program the controller for heating. To use a cold-plate for warming/heating, the polarity of the power to the TECs must be reveresed from that of the cooling mode. Connect the black lead/s from the TE/s (heavier gauge than fan leads) to TLK38-S slot 5, marked "NO" for Normally Open. Then connect the red lead/s from the TE/s to a NEGATIVE (V-) post on the power supply (to change the polarity). 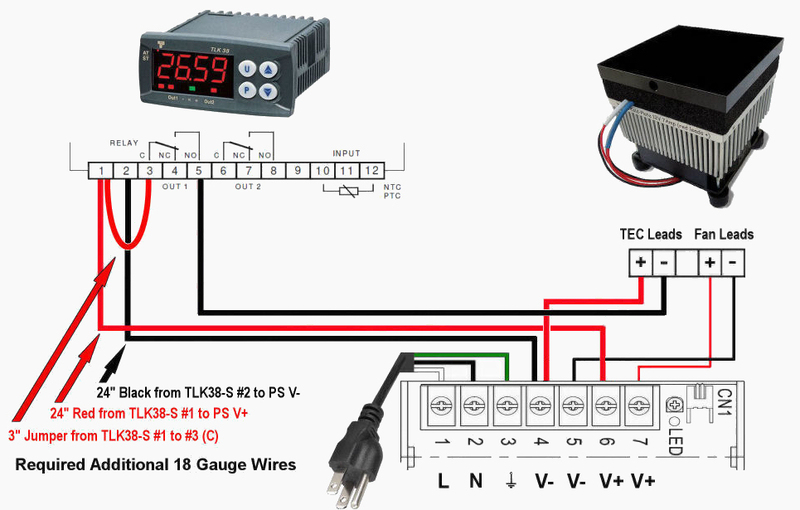 Make all other connections to the TLK38-S and power supply, as described and illustrated (red to + and black to -). Push the TLK38-S “P” button for a 5 seconds until the LEDs flash. Push the down arrow until the Function mode parameter for output one “Fun1” is displayed. Push the P button and the current status will be displayed. If “CooL” is displayed, push the down arrow and “HEAt” will be displayed. Leave the controller alone for about 20 seconds and the new value will be programmed. Finally, change the set-point to the desired temperature (above ambient).